President Trump speaks about the Republican tax bill after signing it into law in the Oval Office on Dec. 22. Trump has signed 96 laws this year. 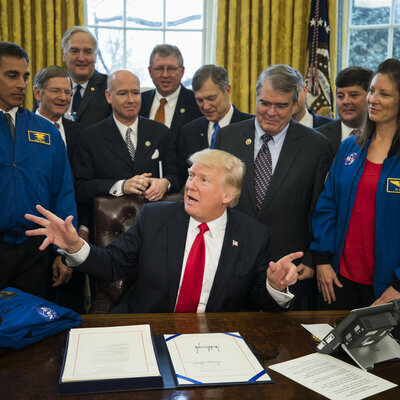 "We have signed more legislation than anybody," Trump said. He hasn't. 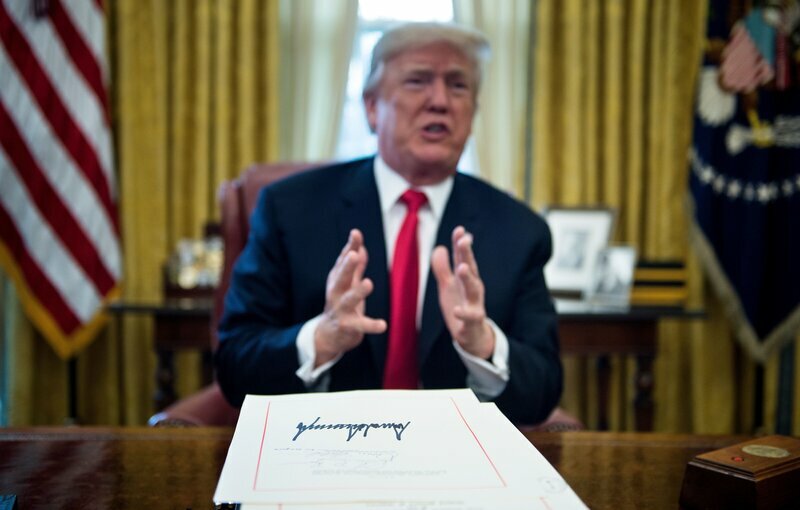 In sheer numbers of bills signed into law during a president's first year in office (Jan. 20-Dec. 31), Trump is behind his six most recent predecessors. 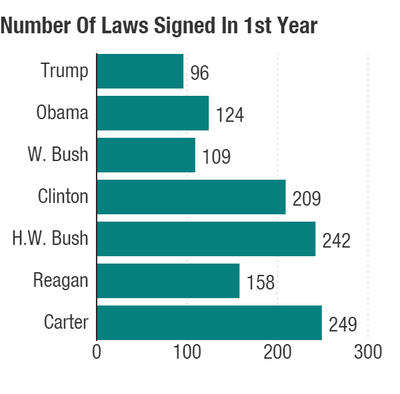 Number of laws signed by each president between his Inauguration Day and Dec. 31 of that year. According to tallies by GovTrack, Trump also trails Nixon, Kennedy and Eisenhower. In making his claim, Trump also boasted that he had exceeded even former President Harry S. Truman's record for the number of bills signed. "Harry Truman had more legislative approvals than any other president and — a record long held," Trump said. "And we beat him on legislative approvals, for which I get no credit." One reason he may not be getting credit is that, according to a rough estimate from the Truman Library, Trump isn't even close to Truman's record. @tamarakeithNPR We don't have an exact figure handy, but around 240-250. According to Statutes at Large, Congress passed 292 bills in that session. Subtracting from January-April, minus few vetoes, gets to that figure. 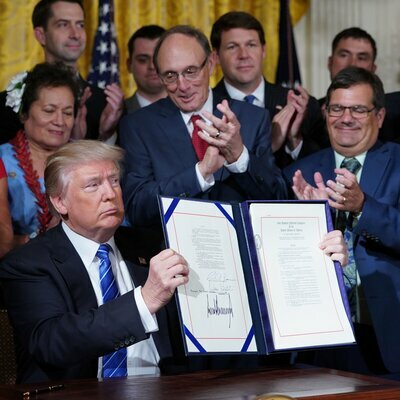 Three White House spokespersons did not respond to a request from NPR to explain which record Trump was referring to, given that he trailed so many of his predecessors in the number of bills signed into law. In any case, tallying laws signed is not necessarily a good way to measure accomplishment. Political scientists say a far better — though more subjective — measure is significance, because not all bills are created equal. For instance, "S 810: A bill to facilitate construction of a bridge on certain property in Christian County, Missouri, and for other purposes" isn't in the same realm of significance as "HR 3364: Countering America's Adversaries Through Sanctions Act." 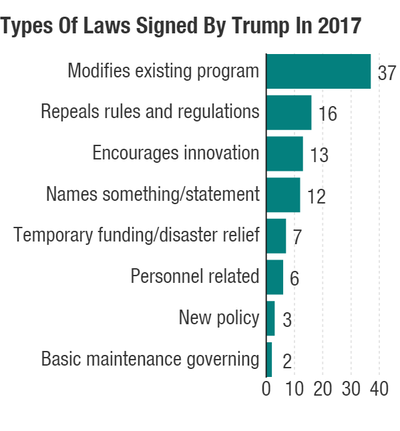 NPR analyzed all 96 laws signed by Trump this year, categorizing them. 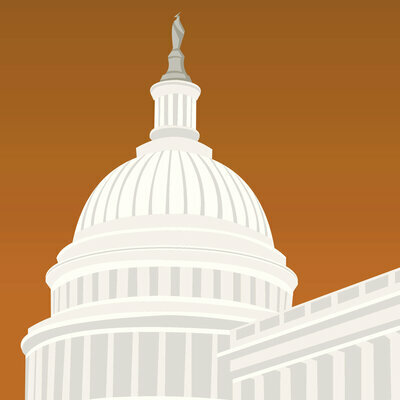 More than three dozen modify or extend existing law; 16 repeal rules and regulations using a process known as the Congressional Review Act; a dozen commemorate or honor people and organizations such as by renaming federal buildings; and seven provide temporary government funding or one-time disaster relief funds. All 96 laws signed by President Trump, categorized. 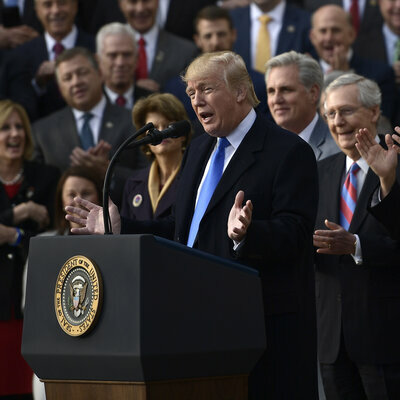 "This tax bill is a big deal," said John Frendreis, professor of political science at Loyola University Chicago. "But I don't think anybody would regard anything else that has come down the line as a significant legislative achievement." These resolutions were passed through a previously obscure process known as the Congressional Review Act, which requires only a simple majority for passage in the Senate. Because these measures can't be filibustered in the Senate, they've been an easy way for Republicans, even with only a narrow Senate majority, to reverse Obama-era regulations that hadn't yet taken effect. HJRes 69 Providing for congressional disapproval under chapter 8 of title 5, United States Code, of the final rule of the Department of the Interior relating to "Non-Subsistence Take of Wildlife, and Public Participation and Closure Procedures, on National Wildlife Refuges in Alaska"
HJRes 83 Disapproving the rule submitted by the Department of Labor relating to "Clarification of Employer's Continuing Obligation to Make and Maintain an Accurate Record of Each Recordable Injury and Illness"
SJRes 34 A joint resolution providing for congressional disapproval under chapter 8 of title 5, United States Code, of the rule submitted by the Federal Communications Commission relating to "Protecting the Privacy of Customers of Broadband and Other Telecommunications Services"
HJRes 41 Providing for congressional disapproval under chapter 8 of title 5, United States Code, of a rule submitted by the Securities and Exchange Commission relating to "Disclosure of Payments by Resource Extraction Issuers"
S 496 A bill to repeal the rule issued by the Federal Highway Administration and the Federal Transit Administration entitled "Metropolitan Planning Organization Coordination and Planning Area Reform"
HJRes 111 Providing for congressional disapproval under chapter 8 of title 5, United States Code, of the rule submitted by Bureau of Consumer Financial Protection relating to "Arbitration Agreements"
HR 609 To designate the Department of Veterans Affairs health care center in Center Township, Butler County, Pennsylvania, as the "Abie Abraham VA Clinic"
HR 375 To designate the Federal building and United States courthouse located at 719 Church Street in Nashville, Tennessee, as the "Fred D. Thompson Federal Building and United States Courthouse"
HR 2210 To designate the community living center of the Department of Veterans Affairs in Butler Township, Butler County, Pennsylvania, as the "Sergeant Joseph George Kusick VA Community Living Center"
TRUMP: It calls for a total modernization of our military, and reversing previous decisions to shrink our armed forces - even as threats to national security grew. It calls for streamlining acquisition, eliminating bloated bureaucracy, and massively building up our military, which has the fundamental side benefit of creating millions and millions of jobs. TRUMP: This strategy includes plans to counter modern threats, such as cyber and electromagnetic attacks. It recognizes space as a competitive domain and calls for multilayered missile defense. This strategy outlines important steps to address new forms of conflict such as economic and political aggression. Probes into Russia meddling enter '18 with no end in sight: Dozens of witnesses still need to be interviewed GOP lawmaker says. Erin Kelly and Kevin Johnson (USA TODAY) December 27, 2017: Congressional investigators are heading into 2018 with no immediate end in sight for their probes into Russia's meddling in the 2016 presidential election and possible collusion with the Trump campaign. Rep. Adam Schiff (D) California says "many months of work lies ahead" for the panel. And he is worried that Republicans on the committee may be trying to rush the investigation to a "premature" close because of pressure from the White House. "There are still dozens of witnesses that need to be brought in," Schiff said. "There are a lot of interactions between the Trump campaign and Russia that still need to be fleshed out." Special Counsel Robert Mueller's instigation into Russia's interference in the election appears to be gaining steam, producing several guilty pleas including one from former National security Adviser Michael Flynn [whom Trump defends vociferously] for lying to the FBI. Mueller's criminal probe on behalf of the Department of Justice is separate from the investigations being conducted by three different congressional committees. In addition to the two intelligence committee, the Senate Judiciary Committee [headed by GOP partisan Sen. Chuck Grassley R-IA] has been running a more limited probe. Mueller's investigation, including any resulting trials, is likely to go even beyond 2018, said University of Baltimore Law School Charles Tiefer and the special deputy chief counsel for the House Iran-Contra committee's investigation of the Reagan administration. "In contrast, I think the House Intelligence committee may well shut itself down early in 2018," Tiefer said. He said Republican leaders of the committee, which has been plagued by partisanship during its investigation, appear to want to end the probe as soon as possible. TRUMP: And our strategy emphasizes strengthening alliances to cope with these threats. It recognizes that our strength is magnified by allies who share principles - and our principles - and shoulder their fair share of responsibility for our common security. Kim Hejelmgaard (USA TODAY-IC PRESS-CITIZEN) December 27, 2017, reports: North Korea will be open to talks with the United States next year, South Korea's government cheerfully predicted Tuesday as part of its 2018 outlook. "In searching for the recognition of its status as a de facto nuclear-possessing state, (the North) would explore the possibility of negotiations with the U.S."
[W]hile some U.S. diplomats, including Secretary of State Rex Tillerson, have indicated they would be in favor of talks with Pyongyang, President Donald Trump has maintained that any talks with North Korea would be doomed to failure. TRUMP: Fourth and finally, our strategy is to advance American influence in the world, but this begins with building up our wealth and power at home. TRUMP: America will lead again. We do not seek to impose our way of life on anyone, but we will champion the values without apology. We want strong alliances and partnerships based on cooperation and reciprocity. We will make new partnerships with those who share our goals, and make common interests into a common cause. We will not allow inflexible ideology to become an obsolete and obstacle to peace. 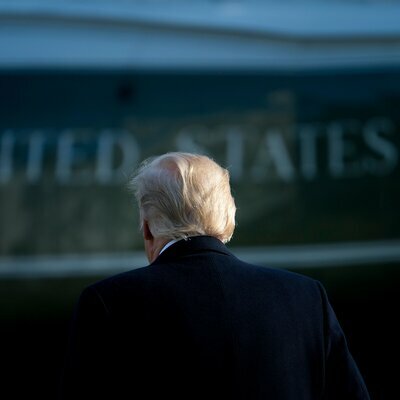 TRUMP: We will pursue the vision we have carried around the world over this past year - a vision of strong, sovereign, and independent nations that respect their citizens and respect their neighbors; nations that thrive in commerce and cooperation, rooted in their histories and branching out toward their destinies. TRUMP: That is the future we wish for this world, and that is the future we seek in America. TRUMP: We must love and defend it. We must guard it with vigilance and spirit, and, if necessary, like so many before us, with our very lives. And we declare that our will is renewed, our future is regained, and our dreams are restored. 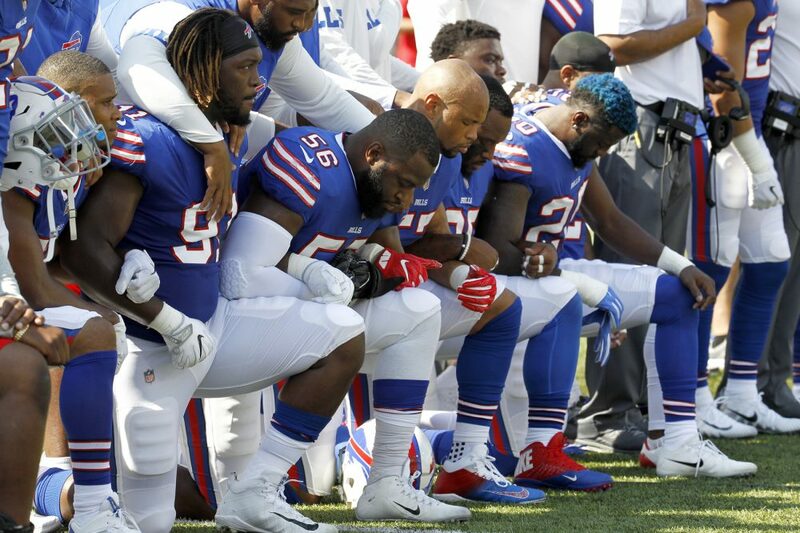 Here & Now's Jeremy Hobson speaks with sports analyst Mike Pesca (@pescami), host of the daily podcast The Gist, about 2017 in sports — from national anthem protests in the NFL to the Houston Astros' World Series victory. This segment aired on December 28, 2017. TRUMP: Every American has a role to play in this Grand National effort. And today, I invite every citizen to take their part in our vital mission. Together, our task is to strengthen our families, to build up our communities, to serve our citizens, and to celebrate American greatness as a shining example to the world. In Switzerland, A Health Care Model For America? Cecile Crettol-Rappaz, seen here with her daughter, Anais, says she had high-quality, but expensive, health care while living in the United States. Her family's insurance in Geneva isn't cheap, but she likes that some of what she pays into the system helps others in need. At first glance, Switzerland's health care system looks like it could be the perfect political compromise for the United States. As Republicans would prefer, individuals — not employers or the government — choose from a broad array of health plans, sold by private insurance companies. And as Democrats urge, everyone in Switzerland has health coverage (it's required by law), with the government providing generous subsidies for those who couldn't otherwise afford it. So does it all run, to use a Swiss cliche, like clockwork? Yes and no. Switzerland's 7.5 million citizens are, by and large, quite happy with the system. "I wouldn't trade it for the world," says Nicole Bieri, an adult vocational education instructor from Lucerne. "I think it's a very good system." But, as in the United States, just about everyone is quick to complain about one thing: rising costs. "The costs have increased in the last 10 years by 50 to 60 percent," says Roland Brunner, a banker from Baden. Indeed, while individuals feel that pain, so do Switzerland's politicians. "They see it in their budget," says Peter Zweifel, a professor of health economics at the University of Zurich. "It's very visible because it's that budget chunk that needs to be reserved for the subsidization of premiums." And the fact that that chunk of the budget grows each year has been particularly frustrating for members of the Swiss parliament, Zweifel says, because "those poor [who get the subsidies] are not those that go to the polls and give you the votes." Still, Zweifel says that in the 1990s, when the current law was being drafted, it was the Swiss populace, by referendum, who insisted that the subsidies be included if there were going to be a requirement that everyone purchase health insurance. "Surveys showed the population was skeptical," says Zweifel, who helped government officials write the law. "They began to figure, 'Hey, now the poor are forced in a system that quite likely will become more expensive as time goes on. They don't have a way to opt out anymore.' So pressure began to increase that the poor shall have [a] subsidy; personalized subsidy of the health insurance premium." But even with the subsidy, there's still a regressive aspect of the Swiss system: health insurance premiums are not linked to income. So everyone pays the same. "I pay what I pay, but my neighbor pays 400 francs also, even though she has a salary which is half mine, and that's unfair," says Cecile Crettol-Rappaz, who works in corporate communications for Migros, the country's largest supermarket chain. Rappaz is in a particularly good position to compare the U.S. and Swiss systems. Not only did she live in the United States for several years — her husband is a videographer for Swiss TV — but they have a daughter with juvenile schizophrenia, so they have been heavy users of health care in both countries. In the United States, she says, care was of high quality, but expensive. "What we found in Washington, D.C., was that it was easy to get good care, but everything costs a lot." Once back in Geneva, she said it took some scrambling to get Anais, then age 11, settled into treatment, but once she did, things were much better. "What we have found here is the best of what the public system can give to us." For example, when Anais needed to be hospitalized for five months, they were able to get her into a special facility for young psychotic children. "That was paid by our insurance. And everything that has to do with her health is paid by that insurance." Anais, who is now 17, also qualifies for Switzerland's disability insurance program, which is even more generous, says Rappaz. "For example, our daughter gets three-times-a-week psychotherapy, and it's her fourth year," she says. Twice a week, her daughter has therapy with horses, using repetitive body motions. And unlike the Swiss health insurance, which requires the family to pay 10 percent of the cost, the disability plan pays 100 percent. Still, the coverage takes quite a bite out of the family budget. Rappaz keeps the bills in a three-ring binder. She pays 400 Swiss francs per month for her basic coverage; her employer contributes 60 francs toward that. Under Swiss law, insurers may not make a profit on the basic plan, which is quite comprehensive. Individuals, however, can adjust their premium up or down by choosing a larger or smaller annual deductible, or by joining an HMO-type plan that requires them to choose a doctor in a network. Since her husband, Bernard, rarely goes to the doctor, they have chosen a network plan for him; his monthly premium is only 298 francs. Children also cost less, so Anais and her brother Lucien's premiums for basic coverage are 89 francs each. Where Swiss health insurers can and do make profits, however, is on supplemental coverage. This is for things like dentistry, alternative medicine (which is popular in Switzerland), and semiprivate or private hospital rooms. For 30 francs per month, Cecile and her husband have a supplementary policy that covers, "for example, all kinds of prevention, not-on-the-list medication, help at home, glasses, transport, alternative medicine. That's a good one," she says. For another 105 francs each, they have another supplemental policy that guarantees them a semiprivate hospital room — and the possibility of a private, rather than a public hospital. "We decided, Bernard and me, that if we have a huge accident or cancer, we want to have the best care or hotel room, so we can get into it because we pay these 105 francs a month. That's amazing how expensive it is," she says with a laugh. The children also have supplemental coverage, although theirs costs far less — 14 francs per month for Lucien, and only 8 for Anais. That is because Anais was not able to get much extra coverage — insurers do not have to sell beyond the basic package to people with pre-existing health conditions. So, all together, the Rappaz family — which is upper-middle-class, but far from wealthy — pays just over 1,100 francs per month for their health insurance. That's over $1,000 U.S. dollars. Yet Rappaz looks puzzled when asked about people in the United States who say that it would be intrusive to mandate health insurance. "I'm not sure that I get you," she says, cocking her head. When the question is put another way, she laughs. "Oh, I see. That's really an American question. You are so used to having this individualistic way of thinking, and that's why you don't have these social [safety] nets. You still have this pioneer mentality where everyone has to take care of themselves." That's not how people in Switzerland think about it, she says. That pioneer mentality, "is good for people who have no problems, but there are a bunch of people who ... need a social net. "I'm really happy to give part of my salary to a solidarity system," she says. TRUMP: As long as we are proud - and very proud - of who we are, how we got here, and what we are fighting for to preserve, we will not fail. TRUMP: God bless you. Thank you very much. Thank you. If you have the time, read. If not, look at the pictures. Americans have always refused to acknowledge the WE rule the world. We are taught by our handlers to always be afraid even though we have or control all the guns and all the food. Don't believe that Donald Trump has power. It is the people in back of Trump that is controlling his every action. I try to get this point across but am always distracted. He is a powerless little twerp of a person...with the nuclear codes. Why wouldn't those pulling the strings laugh at their marionette? They certainly are not fooled.